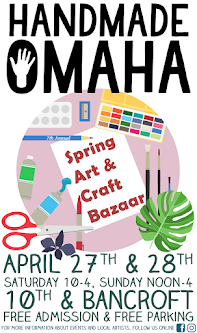 Be sure to say thanks to our favorite volunteers from Gotta be Me at the Handmade Omaha Spring Art & Craft Bazaar April 27th and 28th at 10th and Bancroft! They'll be helping out in the parking lot, manning the Handmade Omaha merch booth, working as greeters, AND selling their own handmade goods! Gotta be Me is a group for all abilities and disabilities artists. Art is part of exploring vocations and jobs with the help of local Omaha artists to teach about the creative life and business. Come on down to Handmade Omaha and meet the artists, shop for one of a kind pieces and learn more!